research has shown that upwards of 80% of prospective customers use Search Engines to source products and services - increasingly on a local level. Therefore, exposure on search engines for keywords and phrases that are highly relevant to your business, products, services and clients is essential to any website and subsequent emarketing plan. identify... Our campaigns are based on solid market research into your business, your competition, your existing / potential customer base and the terms (keywords) they will most probably use to find your products & services. 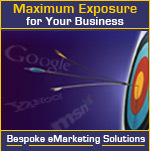 We can track visitors' usage of your website and continually tweak any campaign into increasing profitability. We also offer full reporting & analysis. attract & engage... We offer a range of search engine optimisation and search engine marketing services designed to increase traffic, attract profitable customers, improve brand awareness and provide long-term value to your business. These are often complemented by additional internet marketing techniques such as inbound Link Strategies, Pay-per-Click campaigns, PR / Article creation & distribution and Viral / eMail Marketing. convert... A website that achieves high search engine rankings and attracts a high volume of traffic is all but useless unless it is actively producing contact, interaction and sales... Aside from producing well-written and search engine optimised web design that will inherently provide targeted exposure, cybersphere creates websites that actively engage your visitors and convert them into paying customers. retain... Existing customers are, no doubt, profitable customers - once you've found them you ideally need to maintain a mutually beneficial relationship so that they keep coming back and you can promote new products/offers whilst reducing your marketing expenditure per customer/sale. Depending on your business and your objectives, we can employ many techniques to help you retain customers and efficiently grow your business.